Here is a download for a FREE Mother Goose Quilt pattern for a Mother Goose and Friends quilt or you can get a kit! 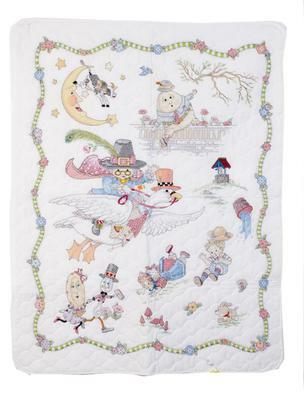 The baby quilt pattern has pictures of Humpty Dumpty, Little Bo Peep, Little Boy Blue, Wee Willie Winkie, Hey Diddle Diddle with a cow jumping over the moon. There are also some nicely illustrated pictures of Old Mother Goose herself! Of all the nursery rhyme quilt patterns that I have seen, I believe that this would be a very quick and easy baby quilt pattern for beginners. There is no applique involved and the pieced star blocks aren't that complicated. The picture blocks featured in the free Mother Goose quilt pattern are actually quilt fabric panels which not only makes for easy quilting but they take a lot of the work out of making the quilt. I love the colors and vintage illustrations. there are various free quilt patterns and fabric resources or it is possible to buy the Mother Goose crib quilt kit as a complete package. I plan to see if I can buy the Mother Goose print baby quilt fabric panels and use my own stash of baby quilt fabric to piece the star blocks to be sure that it matches the colors in my friend's Nursery Rhyme baby bedding set in a Hey Diddle Diddle theme. We would like for Unique Baby Gear Ideas' visitors to share pictures of their homemade baby quilts as well as any resources for free crib quilt patterns. I love the saw tooth border on the crib quilt and am looking for an instructions tutorial with diagrams or a video showing how to do make one.